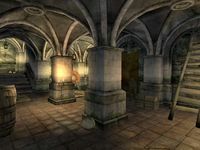 The Copious Coinpurse is a general store located in the Imperial City's Market District. 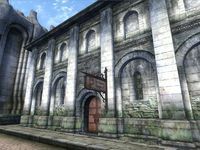 It is found adjacent to the Gate to the Palace District, across the street from the First Edition and next to Rindir's Staffs. The proprietor, Thoronir, has 800 gold, a Mercantile skill of 40, and is reputed to have some of the lowest prices in the city. When bartering, he will buy anything while only selling a variety of miscellaneous items. His wares include the rare weightless Shirt with Suspenders and the unique Imperial Breeches, which fortify your Speechcraft, Personality and Mercantile skills. Upon completion of the Unfriendly Competition quest, several items in the main trading room will disappear from the game (see notes). The Copious Coinpurse is divided into three areas: The Copious Coinpurse, The Copious Coinpurse Private Quarters and The Copious Coinpurse Basement. The main trading room is on the ground floor and consists of a large counter with the inscription "Copious Coinpurse, the shop where your purse is just as full after you buy!" and, carefully placed on several tables and shelves, a selection of Thoronir’s wares on display. The room itself is tastefully decorated with a big round carpet on the floor and several smaller carpets on the wall. The front door opens to the sight of a few benches reserved for waiting customers and a small table with two sacks filled with clutter. The sacks do not respawn. Underneath the table is a watermelon and between the sacks sits a silver pitcher. Following the wall, an open sack with food and a closed one with clutter. These two are safe containers. The table displays a piece of folded cloth and two pumpkins and underneath it, a basket with five potatoes. In the narrow corner near the counter, an open sack with food, which is safe for storage. Along the eastern wall, next to the door, a rack with a roll of cloth. The nearby shelves hold a complete collection of Alessia Ottus' guides to each city, as well as two copies of The Eastern Provinces. The exhibition table in the middle of the room holds pottery, clutter and more folded cloth. Along the stairs leading to the private quarters are several tables with various clothing: a blacksmith's apron, a pair of green felt linens and the ultra rare zero-weight shirt with suspenders. Also, a wide selection of footwear: Two pairs of oiled linen shoes and a pair each of green velvet shoes, huntsman moccasins, stitched leather shoes, braided leather sandals and clogs. The big counter showcases mostly clutter but also a note with a useful method to cure hangover, three tomatoes in a basket and a lectern and some drawers filled with writing materials. The lectern doesn't respawn. 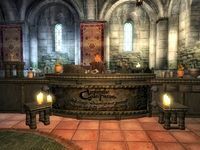 The desk behind the counter contains clutter, and a potion recipe for cure disease and a copy of A Less Rude Song lies on top. In the southwestern corner, near the door to the basement, two crates and a cupboard with clutter. The Private Quarters consist of an antechamber that serves as dining room and a second room with a working table, a library and a bed. The door opens to the sight of a few benches and a table with three apples in a bowl. In the opposite side of the room, a large dining table holds a wide array of food: two strawberries, two carrots, a potato, a head of lettuce, one apple and a cheese wedge. In the nearby alcove stands a cupboard with food. The sack, barrel and crate all holds clutter and the chest has a chance of some jewelry, gold or nuggets. Behind the wooden door, near the spacious double bed, is a cupboard filled with clothing. The writing desk holds only writing materials and the occasional book, while the cupboard in the northern corner holds clutter. 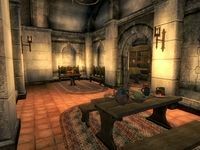 Opposite the cupboard, two sets of shelves represents Thoronir’s library, which includes all four volumes of Brief History of the Empire, all five volumes of The Real Barenziah, as well as copies of Manual of Arms, Darkest Darkness and Ruins of Kemel-Ze. On the same shelves are several magical scrolls: command humanoid, absorb skill: athletics, absorb skill: illusion, greater detect life and serenity, one of each. There are many safe containers: all sacks, two chests and the lectern. Halfway down the stairs, the landing contains two sacks filled with clutter, which don't respawn, a barrel with a chance of a repair hammer and a locked chest with even more clutter. In the main basement area, along the eastern wall, sits a barrel with clutter and the sack near the second pillar holds the same. On the floor in the northeastern corner, near a sack and a barrel with clutter, lies a silver mace and a silver dagger. Nearby, an open sack with food and a barrel with clutter. In the next corner, underneath a discarded ladder, an open sack with food and a crate with clutter. The locked chest nearby holds up to three randomly chosen pieces of equipment. In the last corner, past the stuffed minotaur head, an unlocked chest with clutter and, behind the archery practice pad, an open sack with food and a locked sack and a barrel with clutter. All sacks in the basement and the chest with armor next to the ladder are safe containers. All rolls of cloth are gone, including the rack near the door. All the books by Alessia Ottus are gone. Two additional copies of The Eastern Provinces have been added. The small table near the benches loses one sack with clutter. Two additional silver pitchers have been added. All the displayed clothing is gone (including the zero-weight shirt with suspenders). A new collection have been added: two pairs of green velvet shoes, a pair of doeskin shoes as well as a green wool shirt, a brown shirt, a blue & green outfit and a pair of blue silks. If you need to get rid of something quickly, check out the Copious Coinpurse. Do you ever go to the Copious Coinpurse? Have you ever done any shopping at Thoronir's store? Esta página foi modificada pela última vez à(s) 17h59min de 12 de novembro de 2013.